You are viewing articles tagged cleveland-orchestra. Hey everybody, the Cleveland Orchestra is performing Beethoven’s Fifth, tonight only. So let’s just get it out of the way: the room sounds great. When the music goes lound and fast in the 4th movement of the 9th it was almost overpowering. But where it really shines is on the quiet bits. Bernstein gets all 20th-century-American experimental in the first movement of his symphony, and there are little one and two bar solos for various instruments. Each time, it sounded like the player was sitting in my lap. Your ear adjusts for dynamic levels the same way your eye does going from a darkened theater into bright sunlight, but the Knight hall made everything sound just right. The hall’s sound-modifying features were in their medium-intimate setting, with the canopy in its lowest position and the sound-doors partially open. I spoke to Gary Hanson, the Cleveland Orchestra’s executive director, who told me that this was the orchestra’s preferred configuration, giving the Knight Concert Hall an intimate sound, not unlike that of their own Severance Hall. The configuration was determined during the orchestra’s tuning visit to Miami last year, and will be used for all Cleveland Orchestra performances at Carnival Center. 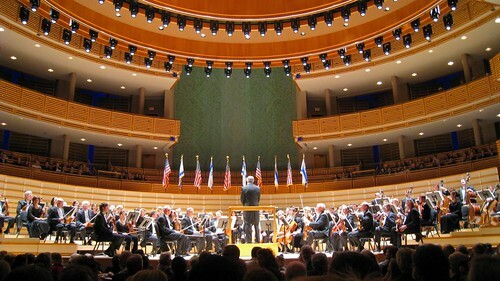 Other orchestras may choose a different configuration; for example, the New World Symphony actually changed the configuration between pieces during their inaugural performance last year. Hanson was enthusiastic about the sound. He pointed out that like any concert hall, the sound is a little more reverberant in the top balconies and a little more present on the floor, but it is generally very consistent, which is in fact one of the marks of a great hall. The Cleveland Orchestra is very happy in the Knight Concert Hall. What do you pair the most famous symphony in history with? Welser-Möst chose Leonard Bernstein’s 1st symphony, which seems odd only at first blush. Bernstein’s three movements are very different from each other; one is probing and experimental in a early-20th century sort of way (quirky two-bar solos! woodblock! ), the second is fast and dramatic, and the third is mournful, and featured Kelly O’Connor’s vocal (which was wonderful, but honestly I couldn’t even tell what language she was singing, and it was English); this was the perfect thing to wake up the ears. And so we have one of the best orchestras in the world in town for a few weeks every year. And while some former members of the defunct Florida Philharmonic feel that this will make it more difficult to re-form a local orchestra, as an audience all we can do is enjoy it. Apropos of that, extra seats have just been released (on the choral riser! should be a great place to sit) for the performances this weekend (Mahler! ), and tickets are also available for the March performances (Tchaikovsky!). I wouldn’t let the high-art thing intimidate me, by the way. Dress nice and bring your active-listening ears and you’ll be fine. If you can avoid wearing a loud jangly bracelet and moving around all night, you’ll be doing better then the woman sitting across the aisle from me (what was she thinking?). There is nothing quite like being in this particular room listening to this particular band; it’s something everyone should do. See also: More information about the Knight Concert Hall at my Carnival Center writeup.